Home Uncategorized Yet Another Umami Location…This Time, Hot Dogs! We know, the news of yet another Umami Burger location has us yawning, too. But now, not only is Adam Fleischman’s ever-expanding empire trying to dominate L.A.’s burger scene—they have their eye on hot dogs, too! 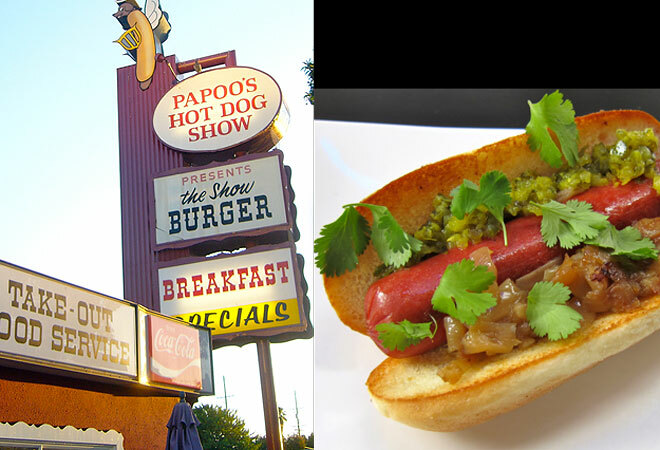 This morning, Umami announced plans to take over Burbank’s historic wiener joint, Papoo’s Hot Dog Show, which closed in 2011 after being in business since 1949. Worry not, conservation buffs (we’re looking at you, Chris Nichols)! Umami plans to keep a considerable amount of Papoos’ iconic 1950s signage. That’s notable beyond the fact that we love the building’s iconic harp-wielding, winged wiener-angel. As is, the signage advertises a number of specific dishes including “7 Hot Dogs,” “The Show Burger,” and “Breakfast Specials.” Umami confirms that they’ll stay true to the sign’s original language, creating seven signature dogs as well as something called a Show Burger, and serving breakfast. Not on the sign but sure to please the hoards of studio workers in the area? Organic milkshakes. Yum.